An Abby Singer. Points. Upfronts. Residuals. Chances are, if you’re reading this you know what these words mean; if you don’t – well, that’s sort of the point. When people ask what makes the people who work in the entertainment industry a culture (in the anthropological sense), I point out that they have their own language. Or rather, in a technical sense, not their own language, but their own dialect. A dialect is a specific subset of a language, used by people in a “discourse community.” This is an (admittedly imprecise) term that means, basically, people who use the same dialect. Speech communities can be based on geographic region, socio-economic class, ethnicity – or in this case, profession. Do you know what an upfront is? The person who paid for this billboard is betting that you do. 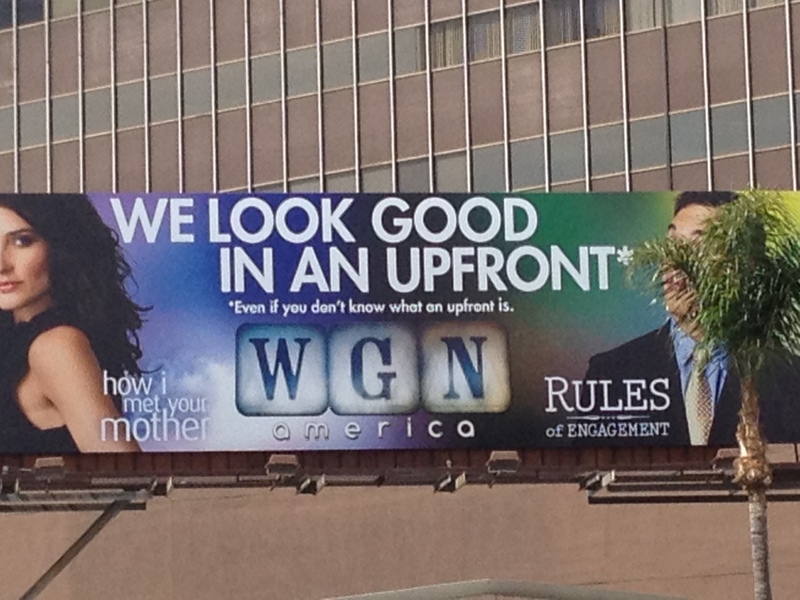 “WE LOOK GOOD IN AN UPFRONT – even if you don’t know what an upfront is.” Now, whoever paid a lot of money to put that billboard up on Wilshire blvd is aiming it at people who clearly do know what an upfront is – otherwise, why advertise to them? But by adding the tagline “even if you don’t know…” they imply to those viewers that they are part of a privileged in-group, people in the know who understand the specialized dialect of the industry. They’re saying that if you know local dialect, like the difference between Above-the-Line and Below-the-Line (and on which side of the line you stand) – then congratulations, you’re one of the cool kids. But defining group identity is just one of the effect of language; specialized language – or jargon, if you prefer – is actually handy to people doing their jobs. One of the most common forms of local language is in the specialized professions of production. Each of the professions involved in production has their own set of terms; a professional language, technically called a “cant.” Sometimes when I talk to a friend who works cameras, for example, I can barely understand him. In Hollywood, even the names for the jobs themselves have meaning only to those who already live and work here: gaffers, grips, and show runners, for example. And how many people in Poughkeepsie know what a production designer does? Two exhaustive collections of the dialect of the entertainment industry can been found in Movie Speak: How to Talk Like You Belong on a Movie Set by Tony Bill (a producer) and Strike the Baby and Kill the Blonde: And Insider’s Guide to Film Slang by Dave Knox (a camera operator). Actually, it’d be interesting to compare the two in-depth, to see the differences in dialect from people with different jobs in the industry. For a more academic look at the language of different professions, you can look for the work of linguist Roger Shuy (he’s written about the language employed by lawyers, doctors, and other professionals). People keep asking what an upfront is, so: upfronts are presentations that networks hold for advertisers, in order to convince them to purchase air time for ads. They have also become the de-facto place for major networks to unveil their lineup of programs; so often it’s the first place where a shows’ future (renewal or cancellation) is confirmed.